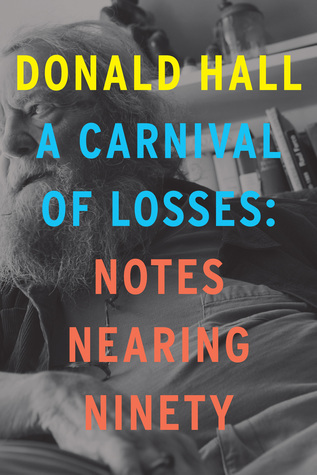 Donald Hall was an American poet, writer, editor and literary critic. He began writing as an adolescent and attended the Bread Loaf Writers' Conference at the age of sixteenthe same year he had his first work published. Donald Hall published numerous books of poetry. Besides poetry, Donald Hall wrote books on baseball, the sculptor Henry Moore, and the poet Marianne Moore. He was also the author of children's books. Hall edited more than two dozen textbooks and anthologies. His honors include two Guggenheim fellowships, the Poetry Society of America's Robert Frost Silver medal, a Lifetime Achievement award from the New Hampshire Writers and Publisher Project, and the Ruth Lilly Prize for poetry. Hall also served as Poet Laureate of New Hampshire from 1984 to 1989. In December 1993 he and his wife poet Jane Kenyon were the subject of an Emmy Award-winning Bill Moyers documentary, "A Life Together." In the June 2006, Hall was appointed the Library of Congress's fourteenth Poet Laureate Consultant in Poetry.